LOOK FOR THE GOLDEN CAPS! In addition to the walks listed below, our wonderful guides will be on and near the Magee Marsh boardwalk each day throughout the festival. Look for the folks in the golden caps with the word GUIDE on the back. These guides are happy to help visitors find, identify, and appreciate the wonderful birds that grace us with their presence on their migration journeys! 1) To reduce the number of people on the boardwalk. 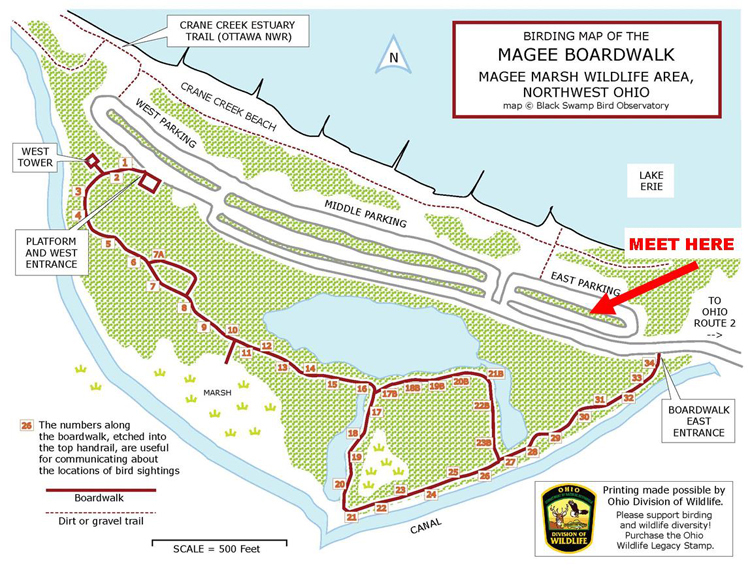 2) To introduce birders to the other wonderful places to go birding on the Magee Marsh Wildlife Area! Groups will split up and visit either the Crane Creek Estuary Trail or the Wildlife Beach at the east end of the area. Both of these areas have hosted Kirtland's Warblers and dazzling concentrations of migrants. Every day during the event, a number of experienced guides will be leading these walks starting from the west entrance of the boardwalk. BSBO lies slap bang in the middle of a breeding territory for the bizarre and fascinating American Woodcock. These walks will take you to see their incredible courtship rituals. 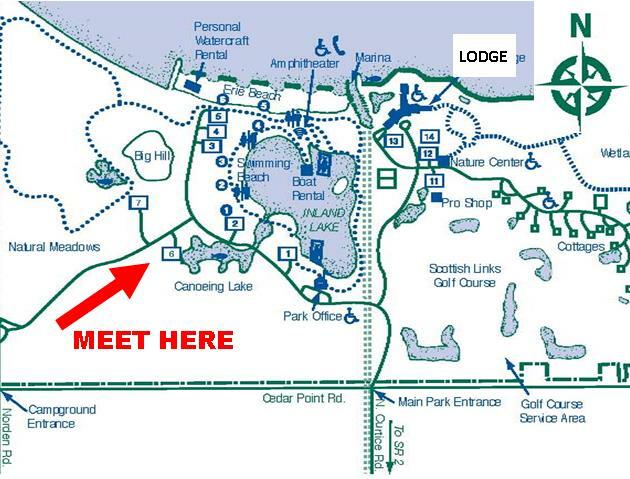 We’ll meet at BSBO and then make the short walk to the trail. We'll wait quietly to listen for their strange PEENT calls and the sound of the male's whirring wings as he takes to the skies in a ritual known as The Sky Dance. These walks are great for all ages - but we must be able to be still and keep quiet in order to have the best experience and not disturb the birds! Maumee Bay State Park hosts a healthy population of breeding American Woodcocks. We’ll meet at Parking Lot 6 (see map, right) and then make the short walk to the breeding grounds. Once there, we'll wait quietly to listen for their strange PEENT calls and the sound of the male's whirring wings as he takes to the skies in a ritual known as The Sky Dance.These walks are great for all ages - but we must be able to be still and keep quiet in order to have the best experience and not disturb the birds! **YOU DO NOT NEED TO BE A MEMBER OF THE OHIO YOUNG BIRDERS CLUB TO ATTEND! ***STUDENTS ONLY! Parents who attend will be led on a separate guided walk. Each year, the OYBC offers a young birders walk at Magee and it's always a blast! Join young birders from all over the state and the country and meet some really cool field trip leaders, too! No need to be a member, and young birders of all ages are welcome! ​On Saturday, May 4, Richard Crossley will be joining the walk. On Saturday, May 11, Katie Fallon will be joining the walk.These authors and speakers from this year's Biggest Week will be able to answer questions and bird with the young birders! ​Binoculars and field guides will be available to borrow for this workshop. You've decided birding sounds interesting and you'd like to give it a try, but what do you do next? In this fun and easy workshop, we'll walk you through everything you need to know to get started birdwatching. We'll point you in the right direction to find a pair of binoculars and a field guide, basic bird identification tips, and where and how to find birds. Binoculars and field guides will be available to borrow for this workshop.